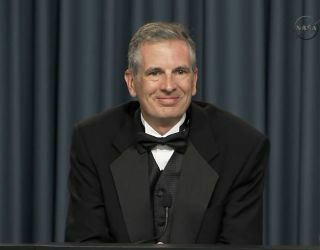 Rick Fitzgerald, Radiation Storm Belt Probes project manager from Johns Hopkins Applied Physics Laboratory in Maryland, always wears a "good-luck" tuxedo for spacecraft launches. It paid off Aug. 30, 2012, when the RBSP mission lifted off successfully from Florida atop an Atlas 5 rocket. The third time was a charm for twin NASA radiation-tracking probes, which launched into space today (Aug. 30) in a dazzling predawn display. And the succesful blastoff just might have received a boost by a handy "good-luck" tuxedo worn by the mission's project manager. After two delays last week, NASA's Radiation Belt Storm Probes lifted off on a mission to study the Van Allen radiation belts that encircle Earth. The probes, dubbed RBSP for short, launched atop an unmanned Atlas 5 rocket a week late due to technical glitches and foul weather from Tropical Storm Isaac. But when the countdown clock ran out at 4:05 a.m. EDT (0805 GMT) today, the booster roared into space from Florida's Cape Canaveral Air Force Station in a flawless liftoff. Who knows if the fancy duds worn by Rick Fitzgerald, mission project manager from Johns Hopkins Applied Physics Laboratory in Maryland, played a part? All kidding aside, a successful launch was no guarantee. Earlier this month, a Russian Proton rocket failed during liftoff in a launch that ultimately left two new satellites stranded in useless orbits. Last year, NASA's Glory satellite, intended to study Earth's climate, crashed into the ocean after its Taurus XL rocket failed to reach orbit in March 2011. A United Launch Alliance Atlas 5 rocket blasts off with NASA’s twin Radiation Belt Storm Probes mission from Space Launch Complex-41 at Cape Canaveral Air Force Station in Florida on Aug. 30, 2012. Liftoff occurred at 4:05 a.m. EDT. So this morning's launch was a definite relief to the scientists who planned the $686 million RBSP mission. "Today, 11 years' hard work was realized by the science team as we stood together watching the rocket lift off the pad. It was the most spectacular sight," said Nicky Fox, RBSP deputy project scientist at the Applied Physics Lab. "They're now at home in the Van Allen belts where they belong, and we've all actually now finally breathed out now that the four solar panels are out on both of them." Scientists will take any advantage they can get to help their missions go off without a hitch. For example, flight controllers at NASA's Jet Propulsion Laboratory in California wouldn't dream of carrying out a crucial mission phase without eating peanuts for good luck. The traditional nuts were passed around just before the agency's new Mars rover Curiosity rover landed on the Red Planet's surface on Aug. 5, for instance. According to JPL lore, six Ranger moon missions in the 1960s failed to achieve their goals until one mission manager brought a jar of peanuts to his shift managing Ranger 7, which finally succeeded in 1964.